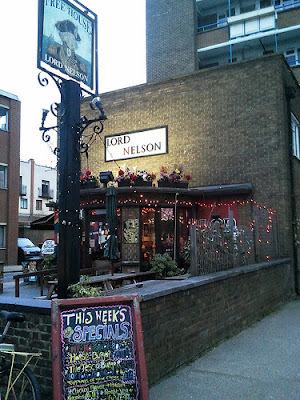 As many of you will probably already have heard, over at the Lord Nelson, on Union Street in Southwark, they've grasped the horse meat scare with both hands and are offering horse meat burgers daily as part of their extensive burger menu. Your author dropped in last night as one of his party was keen on a topical dinner, and found the pub doing a strong trade in all sorts of food and drink, with a number of bookings implying that the Lord Nelson has developed a strong reputation. The menu even featured a 'Tesco burger'...half horse, half beef.